Richmond used its fourth pick in today’s Rookie Draft to re-draft tough, young midfielder Matt Arnot. The Tigers delisted Arnot in early November, but made a commitment, at the time, to pick him up as a rookie-list player for the 2015 season. “The decision to delist Matt was a tough one to make, however it was a necessary list management decision, which enabled us to go into the draft period with the number of selections we wanted,” said Richmond’s General Manager of Football, Dan Richardson. Arnot, who was originally recruited by Richmond at pick 55 overall in the 2011 National Draft, has played eight senior league games, including four in 2014. He has continued training with the Tigers during the pre-season period. Richmond completed its off-season recruiting by officially securing Ivan Soldo, the cousin of the Tigers’ inspirational No. 1 ruckman, Ivan Maric, as a three-year non-registered Category B rookie. 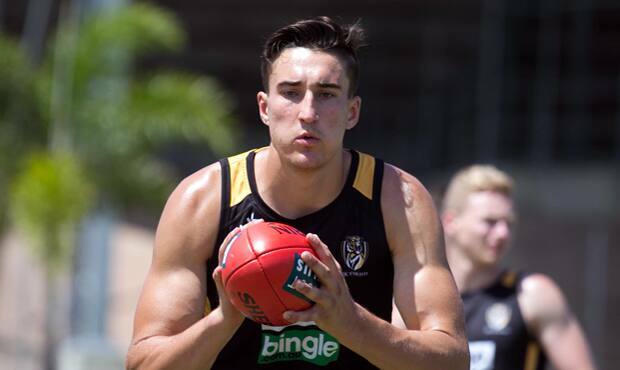 Soldo, a 204cm former state basketballer, has made impressive progress in his training at Tigerland throughout the year. “He’s doing really well,” Maric told SEN.
“I think he came to the Club early in the year, and he was up around 120kg. He’s worked so hard, and now he’s weighing 103kg. "He looks so fit, lean and strong. He looks like a footy player. “His kicking has improved out of sight . . . He’s blown everyone away how much he’s improved his skills.